As you can see, this doesn't tell me if a process is blocking and it only tells me the very basic part of the command they are running. This is slightly better in that it includes the BlkBy column as well as the Program Name. The Program Name is useful to know those users who might be using Access since Access is notorious for pulling entire tables and no using WITH(NOLOCK) to prevent blocking of tables. The query below I adapted from What SQL Statements Are Currently Executing?. 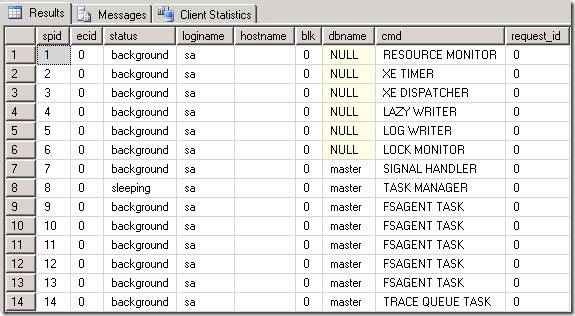 I am working to adapt this to run as a SQL Job to alert us when someone is blocking a query and to send us what they are running. I'll add that code next week when I have it working. -- What SQL Statements Are Currently Running? WHERE --session_Id > 50 AND    -- Ignore system spids. session_Id NOT IN (@@SPID)     -- Ignore this current statement.